Disabled Soviet T-34 being towed by a turretless armored recovery tank, under enemy fire. The eastern front at the time of Operation Citadel. Orange areas show the destruction of an earlier Soviet breakthrough that ended with the Kharkov offensive operation. Green areas show German advances on Kursk. 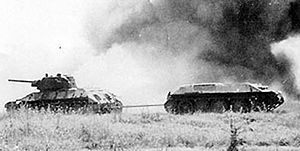 The Battle of Kursk (Russian: Курская битва) refers to German and Soviet operations on the Eastern Front of World War II in the vicinity of the city of Kursk in July and August 1943. It remains both the largest series of armored clashes, including the Battle of Prokhorovka, and the most costly single day of aerial warfare to date. It was the last strategic blitzkrieg offensive the Germans were able to execute in the east. The resulting decisive Soviet victory gave the Red Army the strategic initiative, which it would not relinquish for the remainder of the war. Once the German forces had exhausted themselves against the in-depth defenses, the Soviets responded with their own counteroffensives, which allowed the Red Army to retake Orel and Belgorod on August 5, and Kharkov on August 23 and to push back the Germans across a broad front. Though the Red Army had had success in winter, this was the first successful strategic Soviet summer offensive of the war. The model strategic operation earned a deserved place in war college curricula. 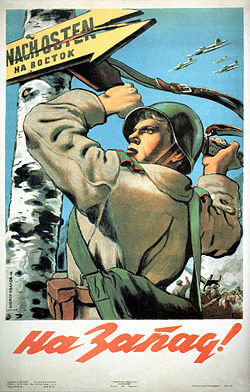 The Soviet victory represented an important step in the defeat of Nazism in World War II. In the winter of 1942–1943 the Red Army conclusively won the Battle of Stalingrad. One complete German army had been destroyed, along with about 800,000 German and Axis troops, seriously depleting Axis strength in the east. In 1917, the Germans had built the famous Hindenburg Line on the Western Front, shortening their lines and thereby increasing their defensive strength. They planned on repeating this strategy in the USSR and started construction of a massive series of defensive works known as the Panther-Wotan line. They intended to retreat to the line late in 1943 and bleed the Soviets against it while their own forces recuperated. In February and March 1943, German Field Marshal Erich von Manstein had completed an offensive during the Third Battle of Kharkov, leaving the front line running roughly from Leningrad in the north to Rostov in the south. In the middle lay a large 200km (120mi) wide and 150km (90mi) deep Soviet-held salient (bulge) in the lines between German forward positions near Orel in the north, and Von Manstein's recently captured Kharkov in the south. 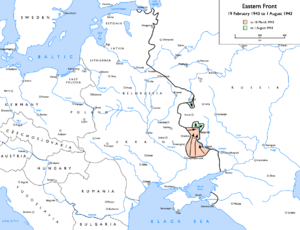 Hitler, now desperate to end the war in the east before Allied military power could threaten German–occupied Europe from the west and south, planned to eliminate the large salient formed around Kursk and destroy the large Soviet forces deployed to defend it. The Oberkommando der Wehrmacht hoped to regain the initiative on the Eastern Front. Although often thought of as a tank battle, Kursk as a whole arguably demonstrated the triumph of artillery, infantry and engineers over armour. The Soviet plan was to soak up the German assault in a colossal web of defensive positions, and only then launch their armoured counter-attack. It was also an important air battle, in which the balance now shifted in the favor of the Soviets. Manstein pressed for a new offensive along the same lines he had just successfully pursued at Kharkov, when he cut off an overextended Red Army offensive. He suggested tricking the Red Army into attacking in the south against the desperately re-forming Sixth Army, leading them into the Donets Basin in the eastern Ukraine. He would then turn south from Kharkov on the eastern side of the Donets River towards Rostov and trap the entire southern wing of the Red Army against the Sea of Azov. OKH did not approve of Manstein's plan, and instead turned their attention to the obvious bulge in the lines between Orel and Kharkov. 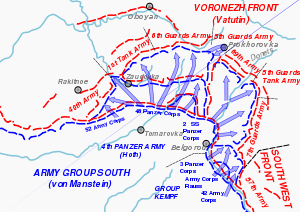 Two Red Army Fronts, the Voronezh and Central Fronts, occupied the ground in and around the salient, and pinching it off would trap almost a fifth of the Red Army's manpower. It would also result in a much straighter and shorter line, and recapture the strategically useful railway city of Kursk located on the main north-south railway line running from Rostov to Moscow. In March the plans crystallized. Walter Model's Ninth Army would attack southwards from Orel while Hermann Hoth's Fourth Panzer Army and Army Detachment "Kempf" under the overall command of Manstein would attack northwards from Kharkov. They planned to meet near Kursk, but if the offensive went well they would have permission to continue forward on their own initiative, with a general plan to re-establish a new line at the Don River several weeks' marching to the east. Contrary to his recent behavior, Hitler gave the General Staff considerable control over the planning of the operation. Over the next few weeks, they continued to increase the scope of the forces attached to the front, stripping the entire German line of practically anything remotely useful for deployment in the upcoming operation. They first set the attack for May 4, but then delayed it until June 12, and finally until July 4 in order to allow more time for new weapons to arrive from Germany, especially the new Panther tanks. Hitler postponed the offensive several more times. On 5 May the launch date became 12 June. But due to the potential threat of an Allied landing in Italy, and delays in armor deliveries Hitler set the launch date to 20 June, and on 17 June it was pushed back to 3 July. On June 21 he postponed it until July 3, and then later to July 5. The basic concept behind the German offensive was the traditional (and, for the Germans, hitherto usually successful) double-envelopment, or Kesselschlacht (cauldron battle). The German Army had long favored such a Cannae-style method, and the tools of Blitzkrieg made these types of tactics even more effective. Blitzkrieg depended on mass, shock, and speed to surprise an enemy and defeat him through disruption of command and supply rather than by destroying all his forces in a major pitched battle. However, such breakthroughs were easier to achieve if they hit an unexpected location, as the Germans had achieved attacking through the Ardennes in 1940, Kiev in 1941, and towards Stalingrad and the Caucasus in 1942. The OKH's plan for the attack on the Kursk salient, "Operation Citadel," violated the principle of surprise: anyone with the most basic grasp of military strategy could deduce that the Kursk salient was the most obvious target for any German attack. A number of German commanders questioned the idea, notably Guderian. The Red Army had also begun planning for their own upcoming summer offensives, and had settled on a plan that mirrored that of the Germans. Attacks in front of Orel and Kharkov would flatten out the line, and potentially lead to a breakout near the Pripyat Marshes. However, Soviet commanders had considerable concerns over the German plans. The locations of all previous German attacks had caught the Red Army by surprise, but in this case Kursk seemed the obvious target. Moscow received warning of the German plans through the Lucy spy ring in Switzerland. This was almost unnecessary, since Marshal Zhukov had already correctly predicted the site of the German attack as early as April 8, when he wrote his initial report to Stavka (the Red Army General Staff), in which he also recommended the strategy eventually followed by the Red Army. I consider it inadvisable for our forces to go over to the offensive in the very first days of the campaign in order to forestall the enemy. It would be better to make the enemy exhaust himself against our defences, and knock out his tanks and then, bringing up fresh reserves, to go over to the general offensive which would finally finish off his main force. The pattern of the war up until this point had been one of German offensive success. Blitzkrieg had worked against all opposing armies, including the Red Army. On the other hand, Soviet offensive actions during both winters showed their own offensives now worked well. However, the overwhelming majority of Stavka members, most notably Zhukov, advised waiting for the Germans to exhaust themselves first. Zhukov's opinion swayed the argument. The German delay in launching their offensive gave the Red Army four months in which to prepare, and with every passing day they turned the salient into one of the most heavily defended points on earth. Two Fronts, the Central and Voronezh, manned the defensive lines, and the Steppe Front was available to act as a reserve. The Red Army and thousands of civilians laid about one million land mines and dug about 5000km (3000mi) of trenches, to a depth of 175km (95mi). In addition, they massed a huge army of their own, including some 1,300,000 men, 3,600 tanks, 20,000 artillery pieces and 2,792 aircraft. This amounted to 26 percent of the total manpower of the Red Army, 26 percent of its mortars and artillery, 35 percent of its aircraft 46 percent of its tanks. Due to the disparity in populations, industrial capability, and continual German delays in tank production, the Red Army could build up forces faster than the Germans; each month they pulled further ahead in men and matériel. The Germans also received reports of rapid and powerful Soviet concentrations in the Kursk area, and delayed the offensive to allow for more Panther tanks to reach the front line. Red Army Maxim machinegun crew in action. Set in the larger vista of the war on the Eastern Front, Kursk is significant because it demonstrated the Soviet high command and staff now worked more effectively than OKH–largely due to the fact that Stalin was finally prepared to act on the advice of his professional intelligence and staff officers, while Hitler was systematically ignoring his. This was evidenced by the defeat of the Blitzkrieg in summer campaigning weather and the ability of the Red Army forces to move from defensive to offensive operations due to better staff work, larger reserves and better planning. In these senses Kursk, and not Stalingrad, can be viewed as the turning point in the war: certainly the initiative passed decisively from Wehrmacht to the Red Army. The Soviet Air Arm played a significant role in hampering the German preparations. On April 17, 1943 a raid on the German airfield at Orsha-South destroyed five Ju 88 reconnaissance aircraft from 1. (F)/100 and 4. (F)/121, and then three Do 17s/Do 217s of 2.Nachtaufklarungsstaffel. Three days later another ten high-level reconnaissance aircraft were destroyed on the ground. As a result the only operational strategic reconnaissance Staffel was 4. (F)/14 The Luftwaffe also had a hand in trying to weaken the position of its opponent before the main operation. The Tank factory at Gorkovskiy Avtomobilniy Zavod (GAZ) was subjected to a series of heavy attacks throughout June 1943. On the night of June 4/5 He 111s of Kampfgeschwader 1, KG 3, KG 4, KG 55 and KG 100 dropped 179 tons of bombs, causing massive destruction to buildings and production lines. All of GAZ No. 1 plant's 50 buildings, 9,000 metres of conveyers, 5,900 units of equipment and 8,000 tank engines were destroyed. However, the Germans made an error in target selection. The GAZ plant No. 1 produced only the T-70 light tank. Factory No. 112 was the second-biggest producer of the more formidable T-34, and continued production undisturbed. Soviet production facilities were repaired or rebuilt within six weeks. In 1943 Factory No. 112 produced 2,851 T-34s, 3,619 in 1944, and 3,255 in 1945. The Luftwaffe had also failed to hit the Gorkiy Artillery Factory (No. 92) or the aircraft plant where the Lavochkin La-5 and La 5FN were made. The Luftwaffe failed to disrupt the Soviet preparation for the coming battle. It took four months before the Germans felt ready, by which time they had collected 200 of the new Panther tanks (only 40 were available at the beginning of the operation due to technical problems with the new type), 90 Elefant Panzerjägers and all 79 flyable Henschel Hs 129 ground attack aircraft, as well as 270 Tigers, late model Panzer Mark-IVs and even a number of captured T-34s. In total they assembled some 3,000 tanks and assault guns, 2,110 aircraft and 900,000 men. It formed one of the greatest concentrations of German fighting power ever put together. Even so, Hitler expressed doubts about its adequacy. The start date for the offensive had been moved repeatedly as delays in preparation had forced the Germans to postpone the attack. Finally, on July 1, the orders were issued to attack on July 5. The following day, Marshal Vasilyevskiy warned the Front commanders (N. F. Vatutin, K. K. Rokossovskiy and I. S. Konev) that the long-awaited German offensive would begin sometime between July 3 and July 6. For months, the Soviets had been receiving detailed information on the planning of the offensive from their Red Orchestra (German: Rote Kapelle, and the "Lucy Group") espionage organization, whose sources included officers in Hermann Göring’s aviation ministry and other parts of the Nazi administration. Preliminary fighting started on July 4, 1943 in the south, as Fourth Panzer Army had elected to try to take Soviet outposts prior to the main assault on July 5. Thus they deliberately sacrificed tactical surprise. Nikolai Fyodorovich Vatutin, after receiving reports that the German offensive was imminent, ordered Voronezh Front to bombard German positions on the night of July 4. In the afternoon, Stuka dive bombers blew a two-mile-wide gap in the Soviet front lines on the north in a period of 10 minutes, and then turned for home while the German artillery opened up to continue the pounding. Hoth's armored spearhead, the III Panzer Corps, then advanced on the Soviet positions around Zavidovka. At the same time, the Großdeutschland Division attacked Butovo in torrential rain, and the 11th Panzer Division took the high ground around Butovo. To the west of Butovo, the going proved tougher for Großdeutschland and the 3rd Panzer Division, which met stiff Soviet resistance and did not secure their objectives until midnight. The II SS Panzer Corps launched preliminary attacks to secure observation posts, and again met with strong resistance, until assault troops equipped with flamethrowers cleared the bunkers and outposts. At 2:30, the Red Army hit back with an artillery bombardment in the north and south. This barrage by over 3,000 guns and mortars expended about half of the artillery ammunition for the entire operation. The goal was to delay and disorganize the German attack. In the northern face, the Central Front artillery fired mostly against German artillery positions and managed to suppress 50 of the 100 German batteries they attacked, resulting in much weaker German artillery fire on the opening day of the attack. This bombardment disrupted German units and caused them to attack at different times on July 5. In the south, the Red Army chose to fire largely against the German infantry and tanks in their assembly areas. This was partially successful in delaying the German attack, but caused few casualties. The real operation opened on July 5, 1943. The Red Army, now aware even of the exact time of the planned German offensive, launched a massive attack by the Soviet Air Force on the Luftwaffe airbases in the area, in an attempt to counter the classic German tactic of eliminating local air support within the first hour of operation. The next few hours turned into possibly the largest air operation ever fought. The Red Army co-ordination of the attack had failed: Red Air Force fighters were dispatched too soon, arriving over German airbases too early and having to withdraw before the arrival of their bombers due to lack of fuel. The German fighters had nothing to prevent them from taking off and engaging the approaching attackers; the Red Air Force lost 120 aircraft. Red Army ZIS-3 76.2 mm divisional guns, often used in the antitank role. The Luftwaffe directed an all-out effort against Red Army positions on the northern flank during the first day of the operation, while Soviet deployment errors granted the Luftwaffe initial air-superiority. However, the Soviets did gain a notable success on July 6. The 299 ShAD of the 16 VA, equipped with the Sturmovik, arrived over the front when the German fighters had returned to base. The 47 Panzerkorps had broken cover and attacked the 17th Guards Rifle Corps and the 16th Tank Corps, and were out in the open and vulnerable to air attack. The Soviet attack was devastating to the tanks of 47 Panzerkorps. Flying as low as six metres the Soviets destroyed as many as 20 in this action, and 40 damaged, for the loss of one IL-2. The Luftwaffe was also experiencing fuel shortages, and as a result the number of Stuka and bomber sorties were declining from as early as the July 6. On July 5 these groups had flown 647 and 582 sorties, by July 6, this had dropped to 289 and 164 missions. Most of the German combat missions were flown by fighters; although they continued to heavily outscore the Soviets, the continual pressure of Soviet aviation began to take its toll on the Luftwaffe and the Heer. On July 7 the Soviet 16 VA flew fewer sorties than the German 1. Fliegerdivision (1,687 to 1,185), but the Soviets, with a few exceptions, were able to prevent further heavy losses, and inflicted serious damage to German ground formations. Soviet losses in the air of bombers and ground attack aircraft on 7 July were light. Total Soviet losses on July 7 were 30 aircraft, for six German (all Fw 190s), on the Northern sector. The Luftwaffe also conducted effective operations at low cost, claiming to destroy 14 Soviet tanks, 60 motorized vehicles, 22 artillery pieces and eight ammunition stores. A further 22 tanks were claimed damaged and 25 artillery guns "silenced." In the first three days of fighting over the northern flank Luftflotte 6 lost a total of 39 aircraft against Soviet losses of 386. The 9th Army attack in the north fell far short of its objectives on July 5. The attack sector had been correctly anticipated by the Red Army Central Front. Attacking on a 45-kilometer-wide front, the Germans found themselves trapped in the huge defensive minefields, and needed engineering units to come up and clear them under artillery fire. Although a few Goliath and Borgward remote-control engineering vehicles were available to clear lanes in the minefields, they were not generally successful. Even when the vehicles cleared mines, they had no on-board marking system to show following tanks where the cleared lanes were. Red Army units covered the minefields with small arms and artillery fire, delaying German engineers clearing mines manually; German losses in the Red Army minefields were high. For example, the German 653rd Heavy Panzerjäger Battalion began the attack with 49 Ferdinand self-propelled guns; 37 of them had been lost in the minefields before 17:00 on July 5. Although most of the lost vehicles were mobility kills rather than permanent losses, they were out of action until they could be repaired. While idle they added nothing to German combat power and were easier for Red Army artillery to knock out permanently. Since the Germans were advancing, any repairable vehicles could be recovered, repaired, and put back into action. Review of attack frontages and depth of German penetration shows clearly that the Red Army defensive tactics were succeeding. Beginning with a 45-kilometer-wide attack frontage on July 5, the next day the German 9th Army attacked on a 40-kilometer front. This dropped to 15 kilometers wide by July 7, and only 2 kilometers on July 8-9. Each day, the depth of the German advance slowed: 5 kilometers on the first day, 4 on the second, never more than 2 km each succeeding day. By 10 July 9th Army was stopped in its tracks. A great deal of the Soviet defensive success was down to its method of fire control, known to the Germans as Pakfront. This relied upon a group of 10 or more anti-tank guns under a single commander, which would fire at a single target at a time. These positions were protected with heavy concentrations of mortar and machine-gun nests, which were ordered to fire on German infantry only. For these reasons the Germans were only able to advance slowly and at heavy cost. On July 26, Model ordered a withdrawal from the Orel salient, to avoid another "cauldron." Soviet forces captured the city on 5 August, and two days later had wiped out the salient altogether. As German forces retreated they applied the "Scorched earth" policy, destroying everything of use to the advancing Soviets. After a week of heavy fighting, the Wehrmacht had advanced only 12 km. On July 12 the Soviets launched their own offensive against the Second Panzer Army and the German Ninth Army at Orel. The situation became critical for the German forces: the Soviet 11th Guards Army could cut off both German Armies. The Luftwaffe was called upon to halt the offensive, and its actions proved decisive to saving the German armies from encirclement. The Luftwaffe organized a massive aerial offensive to blunt the threat. On July 16, the Luftwaffe flew 1,595 sorties, double that of the previous days. In daylight hours the Sturzkampfgeschwader and Schlachtgeschwader attacked Red Army armored units while the Kampfgruppen targeted the rear supply lines. On July 17 further attempts to intervene on the battlefield were hindered by the arrival of an overwhelming Soviet aviation force. This forced German bombers to operate from higher altitudes, and bombing accuracy suffered. The Soviet 16 VA had greatly improved its organization and ground control methods, and its pilots were now improving their tactics. The Soviets took advantage of their superior strength to initiate a series of huge aerial offensives against German positions, using waves of up to 350 aircraft per strike. The offensive resulted in large-scale air battles. The limited engagement of the German bomber and ground attack units resulted in only 24 Soviet tanks and 31 lorries being destroyed. However the German fighter units destroyed 90 Soviet aircraft on that date, for 12 losses. 1. Fliegerdivision had carried out 1,693 sorties that day. Another 1,100 sorties were flown on July 18, and the Junkers Ju 87 units took a heavy toll of Red Army tank forces; Ju 87s of StG 3 destroyed at least 50 tanks. Our "cannon aircraft" took a terrible toll of Soviet armor. We attacked at very low altitude…and my pilot opened fire at a distance of only 50 metres. Most of our attacks were made against the side of the tanks, because in that way they offered the largest targets. I know that some pilots attacked from behind because that was where the armor was weakest, but that also meant the target was so small that it was difficult to hit. By this time Soviet tank crews appeared to be well aware of the potency of our "cannon planes." Whenever we appeared, the tanks would start wild evasive maneuvers. Occasionally we could see tank crews jump out of the hatches and abandon their tanks when we dived to attack them. The Soviet losses were so heavy that they were forced to retreat. Tanks that had managed to reach German positions had been quickly routed. 1.Fliegerdivision had claimed 135 tanks put out of action on 19 July, with a total of 66 destroyed. The 1st Tank Corps had only 33 tanks remaining on 20 July. Realizing the German armies were about to escape the trap, the Stavaka ordered the 3rd Tank Army to pursue the encirclement, and at least catch and destroy the German 35. Army Corps. Once again the Luftwaffe contributed decisively. The Soviet fighter units in the area were disorganized due to constant redirections along the front, and as a result were overwhelmed by a concentrated attack by Luftwaffe forces throughout the day. Over 1,500 sorties were flown, and 38 Soviet tanks, 85 vehicles, eight tank transporters and ten pontoon bridges were destroyed for 13 losses. Model sent a message to von Greim thanking him: "the Luftwaffe's intervention was absolutely decisive to prevent a second, more disastrous Stalingrad". The 9th Army had to withdraw, their part in the offensive over. Because the German armor was not concentrated and used with the same intensity as in the South, the German armor losses were comparatively light–143 armored vehicles were total losses in the period July 5 -14 1943. However, this failed to keep up with the steady influx of new soldiers and matériel for the Red Army. Few Red Army guns were captured, and those Red Army units that did retreat did so on orders. The German attack failed to penetrate beyond the Red Army tactical zone. The offensive opened, as in the north, with a mass of air activity. German air attacks helped badly maul the Soviet 57th and 67th Guard Divisions. As the Luftwaffe shifted its attention against the 6th Tank Corps, it left the skies empty over the 4. Panzerarmee. As a result of Soviet superiority in the air, reinforced Soviet defenses, and a lack of heavy air support, the Großdeutschland Division had around 80 of its 350 tanks operational. Later the 2nd Soviet Guards Tank Corps attacked the flank of the 1st SS Division Leibstandarte SS Adolf Hitler. In desperation, the Germans launched waves of Fw 190 Fs of 4. (Pz)/Schlachtgeschwader 1 and Hs 129s of I./Jagdgeschwader 51's Panzerjägerstaffel to halt the attack. Using SD-2 anti-personnel bombs, the Luftwaffe was able to inflict heavy losses to Soviet soldiers and "soft" vehicles. The Luftwaffe attacked the Soviet 2nd Tank Corps from dawn to dusk, and Hauptmann Bruno Meyer, Staffelkapitain of I./Sch.G 1 noted: "It was impossible for us to count how many tanks we knocked out." As a result of the losses sustained by the Soviet 2nd Tank Corp, the 5th Guards Tank Corps began their offensive against the II.SS Panzerkorps alone, and failed, with heavy losses. By the end of the day 2 VA lost 45 aircraft (including 22 Sturmoviks), 17 VA lost 37 Sturmoviks alone. The Soviets lost approximately 90 machines on this date, while the Luftwaffe suffered 11 losses, mostly of which were Ju 87s. The Soviets began attacking German rear areas at night, with the 2 and 17 VA flying 269 sorties in 24 hours. In the south the Voronezh Front fared less well against the 4th Panzer Army with its LII Corps, XLVIII Panzer Corps and II SS Panzer Corps. The II SS Panzer Corps attacked on a narrower frontage against two Red Army rifle regiments. The armored spearhead of Hoth's 4th Panzer Army forced its way forward, and by the 6th had reached some 15 km past the lines. Again, Red Army planning played a big role. In the south the Red Army had not been able to pinpoint the German attack sectors; this forced them to spread out their defenses more evenly. For example, three of the four Armies of the Voronezh Front had about ten antitank guns per kilometer of front; this contrasts sharply with the Central Front's distribution of guns, which was twice as heavy in the active sectors. Also, the Voronezh Front made the decision to hold the tactical zone much more thinly, leaving a much higher proportion of units in deeper positions compared to the Central Front. Finally, the Voronezh Front was weaker than the Central Front, yet it faced much stronger German forces. The German forces made steady progress against the Red Army defenses, but, as in the north, attack frontages (width) and penetration depth tended to drop as the attack proceeded. The trend was not as marked as in the north, however. Beginning with a 30-kilometer-wide attack frontage on July 5, this dropped to 20-kilometers wide by July 7 and 15 km by July 9. Likewise, the depth of the penetration dropped from 9 km on July 5 to 5 km on July 8 and 2-3 km each day thereafter until the attack was cancelled. Red Army minefields and artillery were again successful in delaying the German attack and inflicting losses. The ability of dug-in Red Army units to delay the Germans was vital to allow their own reserves to be brought up into threatened sectors. Over 90,000 additional mines were laid during the operations by small mobile groups of engineers, generally working at night immediately in front of the expected German attack areas. There were no large-scale captures of prisoners nor any great loss of artillery, again indicating that Soviet units were giving ground in good order. German losses can be seen in the example of the Großdeutschland Division, which began the operation with 118 tanks. On July 10, after five days of fighting, the division reported it had 3 Tigers, 6 Panthers, and 11 Pzkw-III and Pzkw-IV tanks operational. XLVIII Panzer Corps reported, overall, 38 Panthers operational with 131 awaiting repair, out of the 200 it started with on July 5. Nevertheless, it was obvious that the threat of a German breakthrough in the south had to be reckoned with. The Steppe Front had been formed in the months prior to the operation as a central reserve for such an eventuality. Units of the Steppe Front began movement to the south as early as July 9. This included the 5th Guards Tank Army and other combined-arms armies. The German flank, however, stood unprotected as the Red Army 7th Guards Army stalled Kempf's divisions, aided by heavy rain, after the Germans had crossed the Donets River. The 5th Guards Tank Army, reinforced with two additional Tank Corps, moved into positions to the east of Prokhorovka and had started to prepare a counterattack of their own when II SS Panzer Corps arrived and an intense struggle ensued. The Red Army managed to halt the SS, but only just. Little now stood in the way of the 4th Panzer Army, and a German breakthrough looked like a very real possibility. The Soviets therefore decided to deploy the rest of 5th Guards Tank Army. Accounts of this battle remain shrouded in controversy and dispute. The original Soviet account of brave but reckless if ultimately successful mass Red Army assault on heavily armed German armor is now generally discounted; the most recent revisionist accounts suggest a complete Soviet debacle, with the Soviet charge on German armor disrupted not by German tanks but fundamentally because so many T-34s fell down a Soviet anti-tank ditch. On the morning of July 12, Hoth, determined to push for a breakthrough, scraped together the available reserves of the 4th Panzer Army and advanced on Prokhorovka at the same time that the 5th Guards Tank Army launched a series of attacks as part of multi-front counteroffensive scheduled for July 12 and in an attempt to catch the Germans off balance. The SS and Guards units collided west of Prokhorovka in open country punctuated by farms, rolling hills and gullies. What happened next is open to debate with the release of new information from archives. In stifling heat an eight-hour battle began. The German units had 494 tanks and self-propelled artillery pieces in the attack, with 90 percent operational.The men of the 5th Guards Tank Army had not yet been committed to battle, so they were fresh. The German force found itself heavily outnumbered. After the battle was over, the Soviets held the area, and were able to recover their disabled tanks and wounded crews. The battle can best be described as a very costly tactical loss but an operational draw for the Red Army. Neither the 5th Guards Tank Army nor the II SS Panzer Corps accomplished their missions that day. The air battle was also intense: von Manstein had intended it to be the decisive blow against the Red Army forces, preventing a breakthrough to Oboyan and Kursk. The 5th Guards Tank Army had moved mainly at night, bringing 593 tanks and 37 self-propelled artillery pieces into position at Staryy Oskol. The Soviet had suffered bitter losses, and in this region the 2 Va could muster only 96 Strurmoviks, 266 fighters and 140 bombers. The 17 VA could muster just over 300 machines. 17 Va flew 893 sorties over this sector of the front, while Fliegerkorps VIII flew 654. Strurmoviks from 291 ShAD attacked the II. SS Panzer Division throughout the day, causing significant damage to German armored formations. Simultaneously, waves of Hs 129s and Ju 87s caused losses to the 69th Army and 5th Guards Army. Although Soviet tank losses are unknown, a report from the 29th Tank Corps reported "heavy losses in tanks through enemy aircraft and artillery." It also mentioned losses were so heavy that the advance had to be halted, and a switch to the defensive ordered. The Luftwaffe had complete air superiority over Prokhorovka, due to the VVS being concentrated over the flanks of the 4.Panzerarmee. However the Soviet 31 Guard Tank Corps, and the 33rd Guards Rifle Corps fought the II SS Totenkopf to a standstill, employing the tactic of getting in close to German armor and attacking the vulnerable sides of the Tigers. The II SS was soon forced onto the defensive. Although the German formation held, it lost 50 percent of its armor in a prolonged engagement. By the night of 11/12 July, the only success the Germans had to show for their losses was a captured bridgehead over the Donets river at Rzavets. The LSSAH had been stopped by the Soviet 18 Tank Corps; III Panzerkorps and Das Reich were checked by the 2nd Guards Tank Corps and two more Soviet reserve corps. Significantly, earlier in the operation the attacking German units had been squeezed into ever-narrowing frontages by the defenders. Elite Red Army Guards Airborne units were holding firm on the flanks of the very narrow German penetration. The Germans could not squeeze many units into this narrow front, nor did they have the combat power to widen the penetration. Thus, as the attacking Corps moved forward, they continually lost strength due to the need to hold their own flanks. While the German offensive had been stopped in the north by July 10, in the south the overall situation still hung in the balance, even after July 12. German forces on the southern wing, exhausted and heavily depleted, had nevertheless breached the first two defensive belts and believed (wrongly) that they were about to break through the last belt. In fact at least five more defensive zones awaited them, although they were not as strong as the initial belts (and some of them did not have troops deployed). Red Army defenders had been weakened, and major parts of their reserve forces had been committed. Still, the available uncommitted Red Army reserves were far larger than the few available German reserves. On July 16, German forces withdrew to their start line. Severely depleted, the Germans then had to face Operation Rumyantsev, an offensive launched to smash the German forces in the Belgorod-Kharkov area on August 3. 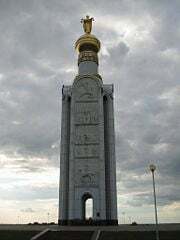 Belogorod fell on the 5 August, and on August 23 Kharkov fell, despite fierce resistance from German forces. With the capture of Kharkov the Soviets considered the Battle of Kursk over. On the night of July 9/10, the Western Allies mounted an amphibious invasion of Sicily. Three days later, Hitler summoned von Kluge and von Manstein to his Wolfsschanze headquarters in East Prussia and declared his intention to "temporarily" call off Operation Zitadelle. Von Manstein attempted to dissuade him, arguing that Zitadelle was on the brink of victory: "on no account should we let go of the enemy until the mobile reserves which he had committed were decisively beaten." In an unusual reversal of their roles Hitler gave von Manstein a few more days to continue the offensive, but on July 17 he ordered a withdrawal and cancelled the operation. He then ordered the entire SS Panzer Korps to be transferred to Italy. Hitler's decision to call off the operation at the height of the tactical battle has since been strongly criticized by German generals in their memoirs, and also by some historians. For example, it has been pointed out that the SS Panzer Korps would have taken three months to be transferred to Sicily, and thus could not possibly have affected the outcome there, while its contribution to the Kursk operation was vital. In any event only one German division, 1st SS Panzer Leibstandarte Adolf Hitler, departed for Italy, and without their equipment. The others remained behind in the USSR to try to stem the Red Army counteroffensive launched in the wake of the failed German offensive. Operation Kutuzov, the Red Army counteroffensive at Orel, decisively changed the situation. German Ninth Army units had to be redeployed to resist this attack instead of continuing their own offensive; units from the southern pincer were given warning orders on July 15 to withdraw back to the start lines held on July 4. The purpose of the withdrawal was to shorten the front, enabling the Germans to re-form a reserve. To the south the Red Army needed more time to re-group after the losses sustained in July, and could not launch its counteroffensive again until 3 August when Operation Polkovodets Rumyantsev commenced. Aided by diversionary attacks on the Mius river further south, the Red Army took von Manstein's hard-won Belgorod. Fireworks in Moscow marked the capture of Belgorod and Orel, a celebration that henceforward became an institution with the recapture of each Soviet city. On 11 August the Red Army reached Kharkov, a city Hitler had sworn to defend at all costs. The German units had reduced manpower and shortages of equipment. Field Marshal von Manstein believed the outcome of the offensive phase of Kursk to be much more grey than black and white. For although the Germans were forced to withdraw, the Germans “managed to, at least, partly destroy the mobile units of the enemy’s operational reserves.” However, despite the losses it suffered in the defensive phase of the Kursk operations, the Red Army managed to go over to a very successful offensive within two weeks, pushing the Germans back to the Dnieper and towards western Ukraine, and Manstein saw the overall campaign as a disaster for the Germans. By 22 August utter exhaustion had affected both sides, and the operations of the Kursk Salient ended. It was followed by a series of successful Red Army operations that led to the crossing of the Dnieper, and the liberation of Kiev during the autumn of 1943. The campaign was a decisive Soviet success. For the first time, a major German offensive had been stopped before achieving a breakthrough. The Germans, despite using more technologically advanced armor than in previous years, were unable to break through the in-depth defenses of the Red Army, and were surprised by the significant operational reserves available to the Red Army in these operations. This was an outcome that few had predicted, and it changed the pattern of operations on the eastern front. The victory had not been cheap however; the Red Army, although preventing the Germans from achieving the goals of Citadel, lost considerably more men and matériel than the Wehrmacht. With the failure of Zitadelle we have suffered a decisive defeat. The armored formations, reformed and re-equipped with so much effort, had lost heavily in both men and equipment and would now be unemployable for a long time to come. It was problematical whether they could be rehabilitated in time to defend the Eastern Front… […] Needless to say the Russians exploited their victory to the full. There were to be no more periods of quiet on the Eastern Front. From now on, the enemy was in undisputed possession of the initiative. German casualties listed in German sources during the operation proper (as opposed to the following Red Army counter-offensives north and south of the salient) in the period 5 to 20 July 1943 were between 50,000 and 57,000. German tank write-offs were between 278 and 323. Yet the numbers of destroyed tanks alone does not tell the entire story. For example, Zetterling and Frankson list only 33 tanks destroyed for the three divisions of the SS Panzer Corps as of July 17, but the number of operational tanks on July 17 as of 19:15 had dropped by 139, leading one to assume that 106 tanks were damaged and not able to take part in the battle, at least temporarily. Red Army casualties were 177,847 as listed in Krivosheev. However, Restayn and Moller point out that Krivosheev's figures for Central Front strength show a decline in strength during the period July 5 to 11, 1943 of approximately 92,700, of which only 33,897 are accounted for as dead or wounded with no explanation given for the further 58,893 losses. Restayn and Moller consider that the missing 58,893 should be accounted for as casualties, in which case total Red Army casualties in this period would be approximately 235,000 (i.e. 177,847 plus 58,893). Red Army armor losses, again according to Krivosheev, were 1,614 tanks and assault guns destroyed. From this point on, a new pattern emerged. The initiative had firmly passed to the Red Army, while the Germans spent the rest of the war reacting to their moves. A new front had opened in Italy, diverting some of Germany's resources and attention. Both sides had their losses, but only the Soviets had the manpower and the industrial production to recover fully. The Germans never regained the initiative after Kursk and never again launched a major offensive in the East. Moreover, the loss further convinced Hitler of the incompetence of his General Staff. He continued his interference in military matters progressively, so that by the end of the war he was involved in tactical decisions. The opposite applied to Stalin, however. After seeing Stavka's planning justified on the battlefield, he trusted his advisors more, and stepped back from operational planning, only rarely overruling military decisions. Predictable results ensued for both sides: the German Army went from loss to loss as Hitler attempted personally to micromanage the day-to-day operations of what soon became a three-front war, while the Red Army gained more freedom and became more and more fluid as the war continued. ↑ 2.0 2.1 figures from German archives. Bundesarchiv-Militararchiv, Freiburg; Luftfahrtmuseum, Hannover-Laatzen; WASt Deutsche Dienststelle, Berlin. ↑ The three SS formations lost approximately 20,000 men (Dunn 1997, 200). ↑ German losses in aircraft cannot be certain for either the Soviet or German periods. Between 5-31 July, the Generalquartiermeister der Luftwaffe reported 420 losses, 192 from Fliegerkorps VII, and 229 from Luftflotte 6 (Bergström, 2007, 121). ↑ Soviet units overclaimed on a huge scale. In the first three days 487 German aircraft were reported as destroyed by 2 VA, while 16 VA claimed another 391. German loss records, for the same period, reveal just 155 losses. Total claims for 2 Va in July was 979 (Bergström, 2007, 120-121). ↑ Source for losses: TsAMO, f. (16 VA), f.320, op. 4196, d.27, f.370, op. 6476, d.102, ll.6, 41, docs from the Russian Military Archive in Podolsk. Loss records for 17 VA are incomplete. It records 201 losses for July 5 - 8. From July 1-31 it reported the loss of 244 (64 in air-to-air combat, 68 to AAA fire. It reports a further 108 missing on operations and four lost on the ground. 2 VA lost 515 aircraft missing or due to unknown/unrecorded reasons, a further 41 in aerial combat and a further 31 to AAA fire, between 5-18 July 1943. Furthermore, another 1,104 Soviet aircraft were lost between July 12 and August 18, (Bergström, 2007, 121). ↑ When the week of combat around Kursk had ended, the perceived infallibility of blitzkrieg was destroyed, along with the future hopes of the German Army for victory or even stalemate in the east. Kursk announced to the world that for every offensive theory, there is a suitable defensive one available to those who devote the requisite thought necessary to develop it. ↑ John Keegan (ed. ), Atlas of World War II (London: Collins, 2006, ISBN 0007214650). ↑ Source: German Nation Archive microfilm publication T78, Records of the German High Command(Oberkommando der Wehrmacht) Roll 343, Frames 6301178-180 confirms Hitler's teletype to Rommel about reinforcing southern Italy with armored forces destined to be used for Zitadelle. ↑ Timothy P. Mulligan, 1987. "Spies, Ciphers and 'Zitadelle': Intelligence and the Battle of Kursk, 1943." Journal of Contemporary History 22 (2): 239. Retrieved November 20, 2008. ↑ V.M. Kulish & A.J.P. Taylor, 1974, 170. ↑ 19.0 19.1 V.M. Kulish & A.J.P Taylor, 1974, 168. ↑ Christer Bergström, 2007. Kursk - The Air Battle: July 1943. (Chervron/Ian Allen. ISBN 978-1903223882), 16-17. ↑ Timothy P. Mulligan, 1987, "Spies, Ciphers and 'Zitadelle': Intelligence and the Battle of Kursk, 1943." Journal of Contemporary History 22 (2): 236, 254. Retrieved November 20, 2008. ↑ 40.0 40.1 40.2 V.M. Kulish & A.J.P. Taylor, 1974, 171. ↑ It is often claimed that the Luftwaffe halted the Western Front's advance on 17 July, but this is a misunderstanding of the chronology; it actually happened two days later. ↑ Figures from Grigoriy Koltunov and Boris Solovyev. 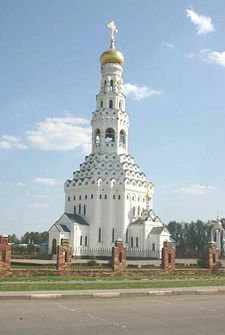 Kurskaya bitva. 1970 in Bergström, 2007, 109. ↑ Anders Frankson, Kursk 1943: A Statistical Analysis. (Cass Series on the Soviet (Russian) Study of War) (New York: Routledge, 2000, ISBN 9780714681030), 30. ↑ Mark Healy, Kursk 1943: Tide Turns in the East. (London: Osprey Publishers,1992, ISBN 978-1855322110), 76-77. ↑ Paul Carell, Hitler Moves East, Volume 2 Scorched Earth. (Boston: Little, Brown, 1970). ↑ 67.0 67.1 Restayn & Moller, Volume II, 341. ↑ Evan Mawdsley, Thunder in the East: The Nazi-Soviet War, 1941-1945. (Hodder Arnold Pub., 2007, ISBN 0340613920), 267. Bergström, Christer. Kursk - The Air Battle: July 1943. Chervron/Ian Allen, 2007. ISBN 978-1903223882. Evans, Richard J. The Third Reich at War. London: Allen Lane, 2008. ISBN 1594202060. Frankson, Anders. Kursk 1943: A Statistical Analysis. (Cass Series on the Soviet (Russian) Study of War, 1st ed.) New York, NY: Routledge, 2000. ISBN 9780714681030. Glantz, David M., and Jonathan M. House. The Battle of Kursk. University Press of Kansas, 2004. ISBN 0700613358. Glantz, David M. Soviet Defensive Tactics at Kursk, July 1943. U.S. Army Command and General Staff College Soviet Army Studies Office Combined Arms Center Combat Studies Institute (CSI Report No. 11), September 1986. Glantz, David M. Soviet Military Deceptionin the Second World War. (Cass Series on Soviet Military Theory and Practice) New York, NY: Routledge, 1989. ISBN 071463347X. Healy, Mark. Kursk 1943: Tide Turns in the East. London: Osprey Publishers, 1992. ISBN 978-1855322110. Keegan, John (ed.). Atlas of World War II. London: Collins, 2006. ISBN 0007214650. Mawdsley, Evan. Thunder in the East: The Nazi-Soviet War, 1941-1945. Hodder Arnold Pub., 2007. ISBN 0340613920. Mulligan, Timothy P. "Spies, Ciphers and 'Zitadelle': Intelligence and the Battle of Kursk, 1943." Journal of Contemporary History 22(2) (1987): 235–260. Restayn, J., and N. Moller. Operation "Citadel," A Text and Photo Album, Volume 2: The North. Winnipeg: J.J. Fedorowicz Publishing Inc., 2006. ISBN 092199172X. Töppel, Roman. Die Offensive gegen Kursk 1943. University of Dresden, 2002. ISBN 9783412201630. Zetterling, Niklas, and Anders Frankson. Kursk 1943: A statistical analysis. New York, NY: Routledge, 2000. ISBN 0714650528. Bergström, Christer. Bagration to Berlin - The Final Air Battle in the East: 1941 - 1945. Chervron/Ian Allen, 2008. ISBN 978-1903223918. Dunn, Walter. Kursk: Hitler's Gamble, 1943. Greenwood Press Ltd., 1997. ISBN 9780275957339. Clark, Alan. Barbarossa: The Russian-German Conflict 1941-1945. New York: William Morrow, 1966. Glantz, David M. The Role of intelligence in Soviet military strategy in World War II. Novato, CA: Presidio Press, ISBN 0891413804. Glantz, David M., and Harold S. Orenstein. The Battle for Kursk 1943: The Soviet General Staff Study. Frank Cass, 1999. ISBN 0714649333. Krivosheev, Grigoriy. Soviet Casualties and Combat Losses in the twentieth century. London: Greenhill Books, 1997. ISBN 1853672807. Manstein, Erich von. Verlorene Siege. (in German). Monch, 2000. ISBN 3763752536. Newton, Stephen H. Kursk: The German View. Boulder, CO: Westview Press, 2003. ISBN 0306811502. Nipe, George. Decision In the Ukraine, Summer 1943, II. SS and III. Panzerkorps. Winnipeg: J.J. Fedorowicz Publishing, Inc., 1996. ISBN 0921991355. Restayn, J., and N. Moller 2002. Operation "Citadel," A Text and Photo Album, Volume 1: The South. Winnipeg: J.J. Fedorowicz Publishing Inc.. ISBN 0921991703. Robbins, David L. 2004. Last Citadel. Orion mass market paperback. ISBN 0752859250. To 1945 unless otherwise indicated. 2 Anti-German, anti-Soviet, and anti-Polish. 3 Lasted the entire war (to May 1945). History of "Battle of Kursk"
This page was last modified on 12 December 2016, at 23:13.